Did you know that we are actually more than just a museum? 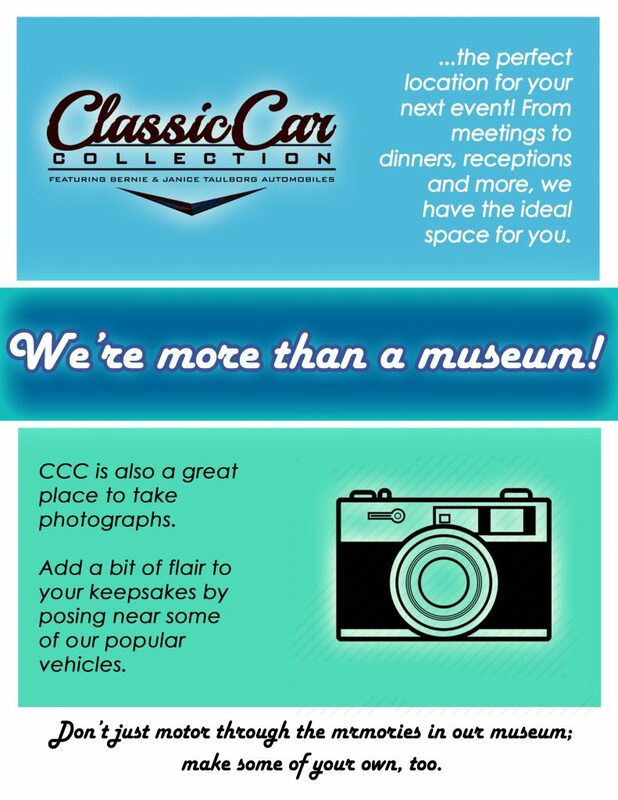 Our display room may showcase over 200 classic automobiles, but our location is also an ideal venue for your next get-together. How would you like to host your next gathering right next to our fantastic displays of gorgeous vehicles? Why book your next event with us? In the past, we have hosted numerous events, including car club meetings, family dinners, holiday parties, wedding receptions, and class reunions. No matter what type of event you’re looking to host, our venue is perfect for you! What’s all included in an event rental? If you book your event with us, you’re sure to have one of the best venues possible, as our experience is second to none. Our charges include: table and chair set-up/tear-down, linens for up to 12 round tables (colors: red, black, or blue), self-guided access to our 50,000 square-foot display room, and on-site assistance from paid staff or volunteers. We also offer the perfect locale for prom or senior pictures! We offer appointments for photo shoots, and we want to help you in any way we can. If you are interested in these services, please call or email for more specifics on pricing or setting up a time that works for you.